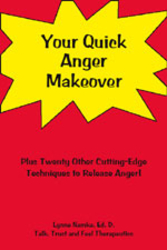 Your Quick Anger Makeover is jam packed with the newest ideas about how to understand and liberate anger and other unwanted, raw emotions. This book is a practical, light-hearted guide to take you through your wildest and woolliest feelings! It is suitable for the professional and lay person alike. It gives a unified theory of emotional intelligence from the early Taoistic texts to today’s hot, new Energy Psychology approaches. Learn the latest ideas blending Western psychology and Eastern spirituality on how to manage and release disruptive emotions. Caught in a rush of excitement that gives permission to act out in anger. There is hope! Integrating the Cognitive Behavioral approaches to address thinking errors contributing to anger and the Energy Psychology techniques to release it quickly gives a holistic approach. Learn sure-fire, quick techniques to banish all unhappy feelings including anger today!